Forests are the perfect setting for learning about colors, animals, and trees. This theme is bursting with fall activities and games for children! Educatall team suggests an imaginary game you can enjoy with your group. (Open thematic letter - Forest) Print the letter. Prepare a bright envelope. Leave it in an easy to find location within the daycare. Have children find the letter and read portions of it to them throughout the theme. Transform your daycare to look like a forest. Trace trees on a roll of white paper or on brown paper bags which you have cut. To decorate the trees, make a hole in the center of dead leaves and thread them on string or ribbon. 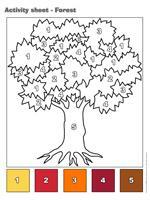 Glue the leaves to the bottom of the tree or trace each child's hand onto colored construction paper to make leaves. Have each child cut out their hand and glue it to the giant tree trunk. Display on the wall. Add pinecones, different colors of apples, etc. (Open word flashcards - Forest) Print and display throughout the daycare. The next time you take a walk in the forest, children will be able to recognize certain animals. The pictures may be used as a memory game or to spark a conversation with the group. Use them to decorate your daycare or a specific thematic corner. 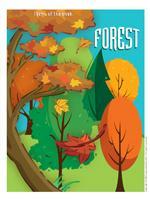 (Open picture game - Forest) Print, laminate, and store in a "Ziploc" bag or in your thematic bins. Hang a large sheet of paper on the wall for children to make a collective mural. Initiate the project by adding a few trees and asking children to add leaves, animals, etc. Picnic: a picnic basket filled with dishes, a blanket, a radio and a CD with birds singing! This activity may also be done for lunch time. Simply set your blanket on the floor in the middle of the room. Regardless of the activity you choose for the role play area, decorate the area with giant paper trees, illustrations from calendars representing the different seasons in the forest, fabric leaves on the walls, etc. The goal is to literally "transform" your role play area to look like a forest. Brown or green modeling dough to create a forest. You may use homemade modeling dough and let it dry to make a model. Why not add yellow, red, and orange modeling dough to make a fall forest? Fabric autumn leaves which can be sorted by size, color, etc. A felt board with figurines from the forest, trees, etc. Fairy tales which occur in forests (The three little pigs, Little Red Riding Hood, Snow White and the Seven Dwarfs, Hansel and Gretel, etc. Headphones and CDs with sounds from the forest, birds singing, animal cries, etc. Pretend you are firefighters extinguishing forest fires: children stand in line with a pail full of water. Have them pass the pail down the line to get to the fire with as much water as possible still in the pail! Prepare a fruit salad with fruit which grow in trees: apples, pears, plums, even pineapples! Create a vivarium and add a few insects. Obviously, you must cover well to avoid surprises! Plant various types of plants, flowers, etc. Build a birdhouse. There are endless possibilities! "Let's walk in the woods, while the wolf isn't here. If the wolf was here, he would eat us up...Wolf, where are you? Wolf, what are you doing?" While the wolf is getting dressed, he answers, "I am putting my socks on". The game continues with, "I am putting my pants on, I am putting my shoes on, I am putting my shirt on, etc." The group repeats the song after each one of the wolf's responses. When the wolf is ready he calls out, "I am going to eat you up!" He then chases after the children. The first child to be captured becomes the wolf. Provide children with several different sizes of boxes and let them play a game of hide and seek in their hideouts, just like squirrels. Fill a small swimming pool or bin with leaves (dried up leaves from trees or fabric leaves). Hide objects among the leaves. When you give the signal, children search for the objects. When they find one, they must deposit it in a hideout, just like squirrels do. They can then continue to hunt for other objects. Once all the objects have been found, start over. Fill a storage bin with water and add leaves. Children blow on the leaves using a drinking straw to make them move. Play music. When you stop the music, show children an animal illustration. Have them imitate the animal, the sound it makes and the way it moves about. When the music starts up again, children resume dancing. When you stop the music, display a different animal. You may use the word flashcards for this activity. Select a child to be the bear. The bear chases the other children until he touches one. The child who is touched becomes the bear. Variation: The child who is touched must stop moving and hold his arms out. The other children can free him by passing under his arms. Several children can have their arms extended at the same time. Change bears frequently. While taking a walk in the forest with your group, invite children to collect objects from nature. When you return to the daycare, hang a large sheet of paper on the wall. As a group, make a collective mural with the objects you collected. A few facts about squirrels. Red squirrels build their nests in branches or cavities in trees. In winter, they live off the food their carefully collected during summer and autumn. A single hideout can contain several hundred pinecones. Take a walk with your group in the forest. Give each child an empty tissue box. They can use their box as a hideout, just like squirrels. Collect as many tiny twigs, leaves, pinecones, and acorns as you can. These items may be used for crafts throughout the theme. Have children make their own beds of leaves. They will love relaxing on their beds. Ask them to observe the clouds. They will identify shapes which they can later draw on paper. Also invite them to listen to the sound of the wind and the birds. 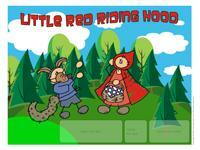 Invite parents to attend a small show during a special Little Red Riding Hood day. Children will be very proud to serve their parents biscuits they made themselves. See the suggestion of the week at the end of the theme. (Open game - Tree full of leaves) Print and laminate the game. Using Velcro, children associate the pictograms to the correct tree. (Open game - Beaver) Print, laminate, and cut out the pieces. Glue the beaver to the wall. Give each child one laminated beaver tail. Children take turns trying to place the beaver tail as close to the beaver as possible while blindfolded. Children choose an animal (use the word flashcards or figurines). They must hide their animal in their hands. The object of the game is to describe their animal or imitate it so the other children can guess which animal each child picked. Stand at one end of the daycare, facing the wall, your back to the group. Ask children to stand with their back to the wall, at the other end of the daycare. Show them a picture of an animal but make sure you don't see it. Have them move towards you making the sound which corresponds to the animal you showed them. You must guess which animal was illustrated before they reach you. (Open hunt and seek - Forest) Print and laminate. Children pick cards and search for the object in the picture. (Open lacing - Forest animals) Print, trace onto cardboard and cut out. Use a hole-punch to make holes all the way around the contour of the animals. Children will enjoy threading a shoelace through the holes. (Open - mice) Print and laminate. Deposit small cardboard mice throughout the daycare, placing them so that only the tails are visible. When you give the signal, children must find the mice. There is no winner for this game. The only goal is for children to have fun. At the end, you may give each child a mouse to take home. Variation: You can color the mice using different colors and ask children to find only a specific color. 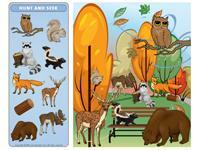 (Open association game - Forest animals) Print and laminate the two series of forest animals. Give children the cards. The object of the game is to associate the missing animal parts. Add a few camping necessities to a cooler: flashlight, fishing pole, bag of marshmallows, etc. Take the items out one at a time and have children name them. Explain to your group how we sometimes have unwanted visitors when we go camping in the forest. Remove an item from the cooler and have children guess which item is missing. Cut out the animal tracks. (Open animal tracks) Glue them to the floor so they form a path. When children follow identical tracks, they will discover which animal the tracks belong to. Glue the corresponding animal at the end of each path. Paths can lead to the bathroom, to the sink, etc. Use three empty storage bins. Glue a different color leaf onto each bin (example: green, red, and brown). Deposit a large bag of leaves beside the bins. Children sort the leaves by color. Have children sit in a circle, begin the game by saying, "I am going in the forest, I am bringing..." (for example: a flashlight). The child sitting next to the first child must repeat, "I am going in the forest, I am bringing a flashlight and..." Each child must repeat the items chosen by the previous children and add one of his own. Children will love playing in their own cabins. Drape old sheets over furniture, tables, and chairs to make tents or cabins. Add objects which can be found in the forest. Let children play and eat their snack in them. Cut a potato in two. Place the cut side in a plate. Encourage children to insert toothpicks into the round part of the potato. (Open scrapbook - Walk in the forest) Print for each child. Take a walk in the forest and invite children to collect twigs and leaves they can glue on their scrapbook page. You may also add a photograph. Add the page to each child's scrapbook (Open scrapbook). 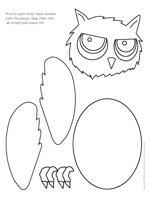 (Open craft - Forest animals) Print for each child. Have children color the pieces. Glue them onto an empty toilet paper roll. Search for large stones in the forest. Let children paint them. Collect branches with your group. Children can decorate them with paint and sparkles. You may also use the branches as paintbrushes. Dip the branches in several colors of paint. Gather all the animal figurines you can find. Make tracks in salt dough and let dry. Ask children to associate the animals to the tracks. This activity can be adapted. The tracks can be done in paint, on a sheet of paper, or in a sandbox. Collect elements of nature you can dip in autumn-colored paint. Make prints on paper. (Open craft - tree) Print for each child. Encourage children to fill the tree trunk with crumpled pieces of brown tissue paper. Next, crumple several tiny pieces of red, yellow, orange, and green tissue paper and glue them around the tree trunk. Have children build their own miniature log cabin using empty toilet paper or paper towel rolls. If you prefer, you may use a cardboard milk carton. Paint it and glue coffee sticks to it. (Open creative coloring - Forest) Print for each child. Have children complete the drawing with what they see in the trees, in the forest. Greet children wearing a red cape. Place a red and white checkered tablecloth on the floor and sit on it for circle time. Take an imaginary walk in the forest (pretend to look at the trees and insects, jump over a tree root...) on your way to the tablecloth. Combine the margarine and the brown sugar. Add the two eggs. Prepare the dry ingredients. Melt the margarine, add boiling water, and then the dry ingredients. Add the vanilla at the end. Deposit approximately 1 teaspoon of the biscuit preparation on a cookie sheet at a time. Bake in a 325⁰F oven for 15 to 20 minutes. Prepare the biscuits with your group and serve them as a snack with parents. 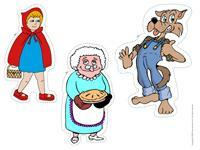 Prepare a small show (Open characters - Little Red Riding Hood). Let children decorate their puppets. Prepare a small story with the characters from the story. Present the puppet show to parents or for another group of children. You can make a small puppet theater or simply paint an old sheet. Hang it to look like a large curtain. Organize your daycare to make it look like a theater. Adjust the lighting with red light bulbs. Use your imagination, but especially children's imaginations!